Experts say English learners need to learn a large body of words to succeed on language tests and at English-speaking universities. Alicia Biler and Ray Knight teach at the English Programs for Internationals at the University of South Carolina. They say one of the most common problems English learners face is remembering and using vocabulary words. "Unlike other languages that use more grammar or more word endings to express different meanings, English uses vocabulary to do that job," Biler said. "I think the suggested range for reading a newspaper is around 5,000 words, but for students who want to be successful academically -- let's say at a university level -- they need to know somewhere around 10,000 words." Biler adds that English learners need to see or hear a word about 10 times before they feel at ease with the word and start using it. If you need to learn a lot of unfamiliar words, and you have to remember those words, what can you do? How can you get vocabulary into your long-term memory? Mary Pyc, a cognitive scientist who studies human learning, says one helpful method for long-term learning is to test yourself. The easiest way to do this, she explains, is to create flashcards. One side of the card should have the word in English. The other side of the card should have the definition, or meaning, in your native language. 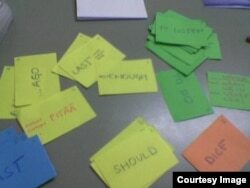 By using flashcards -- and slowly building up the number of cards – you will remember more words. Regular testing helps, but cramming -- or trying to memorize a lot of information in a hurry before a big test -- won't lead to long-term learning. "The day later, you're not going to remember any of that information," Pyc says. Ray Knight says there are several websites that can help with testing. He suggests Quizlet, Memrise, and English Central. Alicia Biler adds that English learners can be helped by taking free language tests, such as Nation's vocabulary test. While Nation’s test does not give you definitive answers about your English abilities, it can help show you where you need to improve, she says. Building a large vocabulary and getting all that information into long-term memory are not easy tasks. However, with effort, a little sacrifice, and training you can increase the number of vocabulary words that you know.